Outline: Tells of the power of Christ during His life on earth - healing, raising the dead, casting out demons. Jesus has power to help, transform our lives. His love, atonement, and power to deliver us from Satan's power. Applications needs strengthening. Similar to"Jesus the Mighty One", "Who is He? ", and "Jesus Can Heal Your Soul." I want to tell you about a man who once lived on this earth. He never did evil. All the people wanted to hear His words. He never spoke a lie. He spoke only truth. This man had great power. 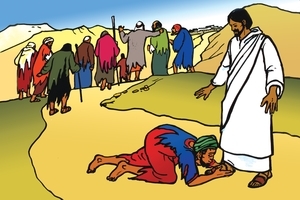 One time He put His finger on the eyes of a blind man, and the blind man's eyes were healed (his blindness was finished). He could see. On another day, this good man healed ten lepers. This was only a small work for Him. You haven't yet heard of the big thing He did. One day He saw a crowd of people. They were carrying the body of a dead boy. They were going (taking him) to bury him. His mother was crying. This man felt sorry for her (pitied her). He walked into the crowd and spoke to the dead boy. Immediately he began to breathe. He stood up. He was alive again! All the people were filled with joy because of the wonderful thing this man had done. This man did so many good things, who is He? He is Jesus Christ, the Son of God. He came to the earth and was born as a baby. He grew to be a man. He did many good things for the people. One day there was a very sick man. Evil spirits (demons) lived in him. All the people were afraid of him. They did not agree for him to live in the village. (among them) They tied him with ropes, but the man broke the ropes. The bad spirits were very strong. This man tried to heal himself, but he could not. He knew that God alone could help him. One day he saw Jesus and ran to meet Him. Jesus saw the man but He was not afraid of him. Jesus is more powerful than evil spirits (His power surpasses the power of evil spirits) and Satan and all others. When the man came to Jesus, Jesus helped him at once. He came close to the man and said, "Evil spirits, go out and leave this man!" He only spoke to them. Immediately the evil spirits left the man. Wherever Jesus is the evil spirits have to leave that place. Jesus gave this man a new character. The man did not want to continue his wicked ways as before. Jesus had made him new. He said to Jesus, "Thank You, Jesus. Now I am a new man. You drove the evil spirits away. From now on I want you to be my Master (Big Chief) always." The man was very happy. All his fears left and he had peace in his heart (his heart rested) (his heart lay down). He told all the people in the village about Jesus. They were not afraid of him now. They understood that Jesus had great power and that He has power to make people good. Many of them left their evil ways and asked Jesus to cleanse their hearts. From that time onward, they did what was good in God's sight. Jesus is the only One Who can make us new. All of us think bad thoughts and do bad deeds. (All the people think evil and do evil.) We cannot make ourselves (our hearts) good. The evil in us is very strong. Jesus loves us all. He is really God. He came to the earth and died (shed His blood) to become the sacrifice for our sins. (He took our punishment - He made the payment for our sins.) Then He arose and returned to God's place. Because He did all this for us, He is able to take away our sins. He can cleanse our hearts. He can deliver us from the power of Satan. He wants to do this for everyone. There are only two Masters (big chiefs) in the world. They are Satan and Jesus. From birth, everyone belongs to Satan. Jesus is the only One Who can deliver us from his hand. When you agree to let Jesus deliver you, you will become His. It is much better to belong to Jesus than to Satan. Jesus is a very good chief (Master). When you die He will take you to live in His good home forever. Do you want Jesus to be your Master (Big Chief?) Ask Him to cleanse the evil from your heart and make you new, and He will do it. GRN has recorded a version of this script in 362 languages and dialects. See full list.